Stand in line at the counter for a few minutes and place your order. The complete menu is posted on the wall just in front of you. 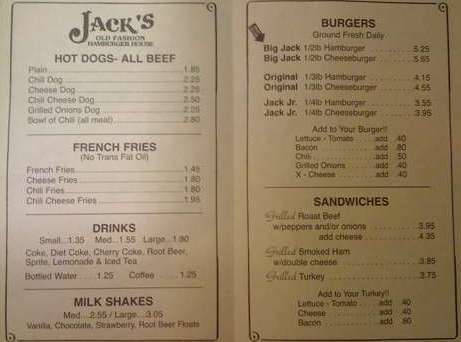 They have a few sizes of hamburgers and cheeseburgers as well as some grilled sandwiches, hot dogs, french fries, etc. While you are waiting for your custom cooked order, choose a seat and start picking out the condiments you want to accompany your meal. Take a few throwaway cups for ketchup, mustard, mayo, pickles, relish, onions, jalapenos, etc. The food at Jack's is consistently good. It's a nice place to go where you can take a friend and get a quick burger and fries. My usual order consists of a 1/3 pound hamburger and the grilled smoked ham with double cheese sandwich with an order of fries. I add some pickles and mustard to the smoked ham and it is dee-lishus! 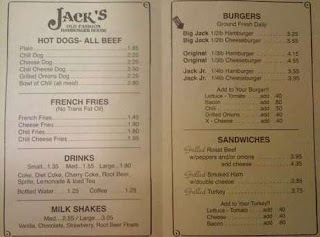 I can't find a website for Jack's (I guess they really are still in the '70's?) but everyone from Fort Lauderdale has been there. Drop by sometime, enjoy the grub, and tell them you read about it here, at the White Plate Special!